I am one of the leaders for the 16-18 year old girls in my church. With such a role I get to do fun things like go to Girls Camp and plan activities for the girls each week. Every year we introduce a new theme and welcome the girls who will be coming into Young Womens that year at an event called New Beginnings. 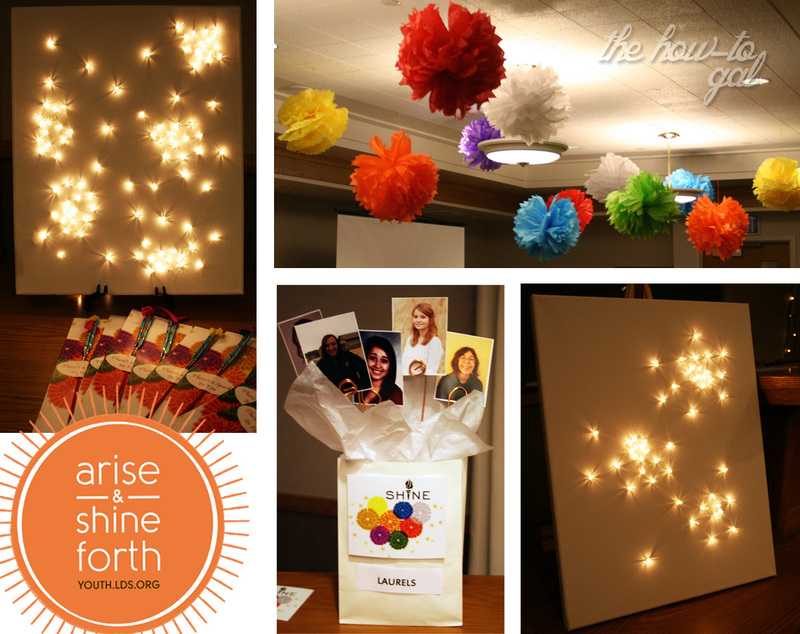 This year's theme is Arise and Shine Forth. My group of 16-18 year old girls were in charge of decor and we had such a fun time decorating for the evening, I had to share some pictures with you. We chose to embrace fireworks as our symbol of arising and shining forth and created "firework-inspired" elements throughout the room. Most of our ideas were found at the Sisters in Zion blog. Hanging from the ceiling were the infamous tissue paper pom poms in the value colors of white, blue, red, yellow, green, orange and purple (missing gold). Decorating the tables were these awesome canvas light pieces. The girls each made their own and were able to take them home to decorate their rooms at the end of the night! Every girl was sent home with a hanging pom pom and a card that read "There's a Spark in You" with two sparklers slide into it. It was a night filled with reminders of how important it is to stand up for what you believe in - no matter what. Love the NB decor! I bet the girls had a great time:) Love the Pom Poms! !